Teething Beads: Jewelry for moms to wear and babies to enjoy - Hits and Mrs.
Is your baby at a stage where he or she is experiencing tooth eruption? Your little one may be getting irritated or uncomfortable about a new tooth coming out, so he or she goes biting or chewing on things. This is the time when we, parents, seek out a teether that will give our babies comfort and relief from the pain caused by tooth eruption. But with the many choices in the market, what’s the best teether to get for our precious ones? Enter Teething Beads, jewelry made to be worn by moms and enjoyed by babies. Yep, it’s a teether in a fashionable form, made to be worn as an accessory for mommies that babies can chew on at the same time. Interesting, right? Teething Beads are made from 100% silicone, similar to the baby pacifiers and teats of feeding bottles. It’s safe to use for babies — it contains no PVC, phthalates, BPA, lead, cadmium, or metals. The beads also come in different colors and shapes that your little ones will like. The necklaces, like the one above, have a break-away clasp that can handle tugs and pulls. The bracelets, on the other hand, feature a knot-type lock that can be pulled to your desired wrist size. Furthermore, the bracelets can be used as a reminder for breastfeeding moms on which side they have just nursed. 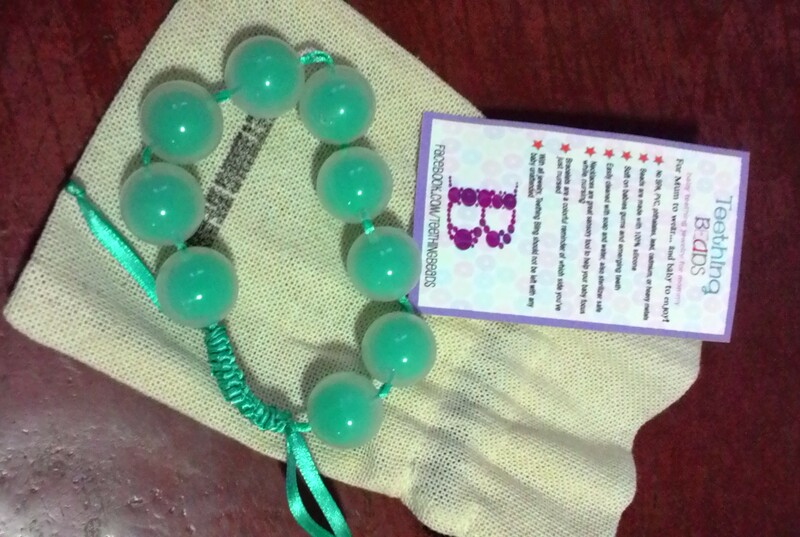 I was lucky to receive both a necklace and bracelet from Teething Beads. Here they are in action. Erm, sort of. My 6-year-old saw the bracelet and wore it immediately as a regular accessory. Dear, you may be growing a tooth, but you’re kinda big for that already. Hahaha! Now this is my 10-month-old girl. She’s got a tooth growing now. She likes touching the beads more than chewing it, though. 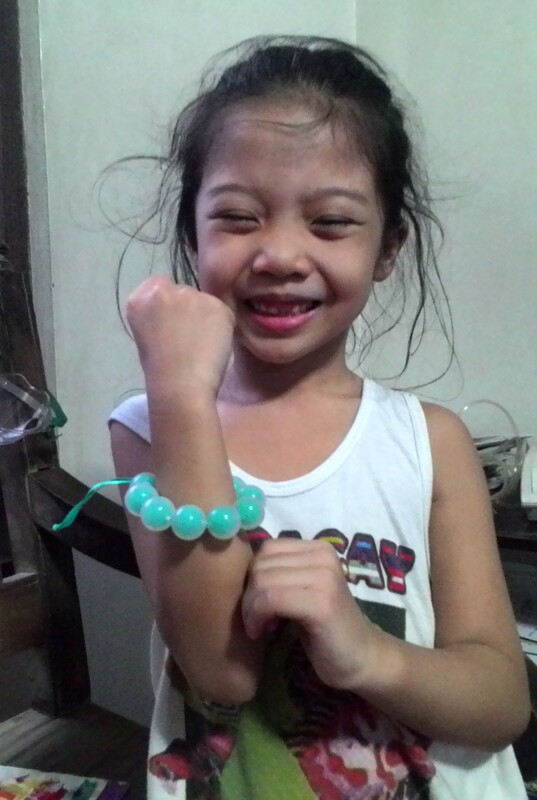 It’s been days since I got the beads, but my bunso still plays with them with her hands. She hasn’t gotten into biting them yet. 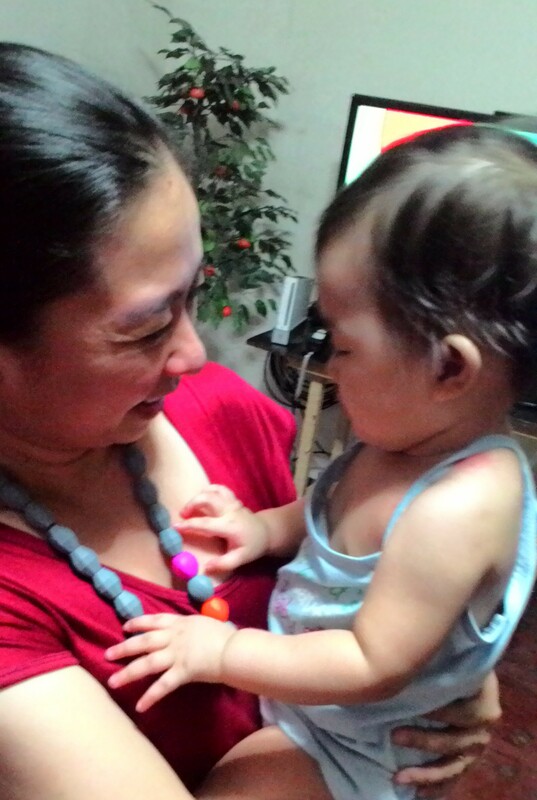 I just realized that the necklace, because of its shape, can also help in developing her sense of touch. And because it’s colorful, she’s easily attracted to it (she keeps on pointing at and touching the yellow and orange beads). So it’s more than just a teether! The Teething Beads are washable and sterilizer-safe, so you need not worry about cleaning the necklaces and bracelets. Fashion, form, and function — Teething Beads combines these features in one pretty package. Want to have your own? You can order through their Facebook page, or call 0917-8120525 (Margie) and 0917-5510422 (Maylee). 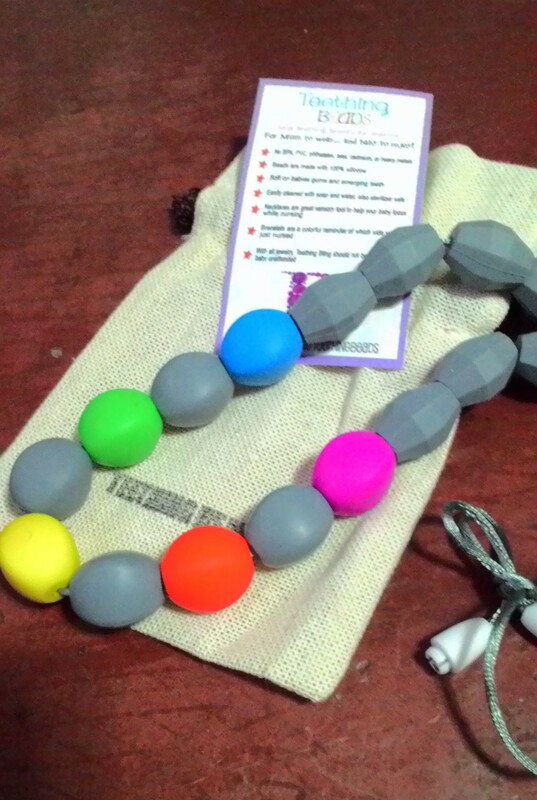 I also bought teething beads last Mommy Mundo Clear-Out Sale. At first, I was very hesitant that it will be very useful for my son. But as day goes by, it became his favorite teether among his other teethers. Sobrang useful siya para sakin, kasi pwede mo siyang isabit para pag nabitawan ni baby di ko na kelangan pulutin pa.